Each KM3xx series setup includes a "KM" mask and non-rebreathing valve. They are not intended to be reused. The setups do not include the head gear # KM800 and Strap Attachment Plate # KM900. Starter kit includes 4 large, 4 medium and 2 small masks with non-rebreathing valves and 22mm ID connecting hose. 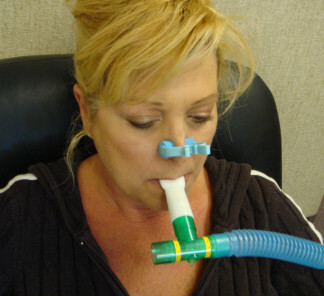 The other setups include 10 masks of stated size with non-rebreathing valve. KM-series masks are the air cushion masks originally supplied with VacuMed instruments. Click here to read more about the "KM Mask"
17605-4 High-Flow Valve Kit includes small, medium and large V-Masks, headgear, large high-flow T-valve and large bore (1-3/8") tubing. As in photo on left. Click here to read more about the "V2-Mask"
17605-2 High-Flow Valve Kit includes small, medium and large KM-Masks shown in top photo, headgear, large high-flow T-valve shown in bottom photo and large bore (1-3/8") tubing. After purchase of this setup, only disposable low-cost KM-Masks need to be replaced. Starter kit # MP100 inludes 10 # MP200 kits plus 60" (152cm) long x 22mm ID reusable hose to mixing chamber with adapter to 1-3/8" mixing chamber port (if needed). Each kit # MP200 includes mouthpiece, non-rebreathing valve, nose clip, and short extension tube to connect to reusable 60" tube supplied with Starter Kit MP100.